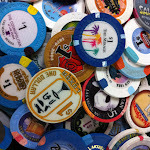 This week’s winner comes to us from @luxorlv in a rather odd way. They were plugging their new pinterest account, as all properties seem to be doing, and promised that by following them, you would get to see rare, never before seen pictures of Luxor. The teaser photo they shared is our winner. It’s an areal photo of Luxor, not long after it was built. Construction on Mandalay Bay hasn’t begun so you still see the Hacienda. It’s before the Zigarat Towers. 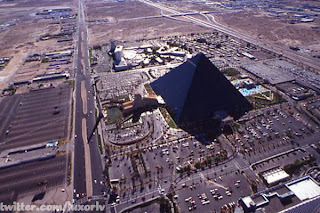 Something I didn’t know that is clear in the photo is that, it appears the monorail or connecting Luxor and Excalibur is up and running but since Mandalay Bay doesn’t exist, the station is on the north side of the pyramid instead of in front of the sphinx like it is today. Being so familiar with that landscape now, the stark contrast is absolutely captivating. Great pic.